…not “that cigarette”, as the lyrics go — but smoke from numerous fires currently raging throughout Northern California. 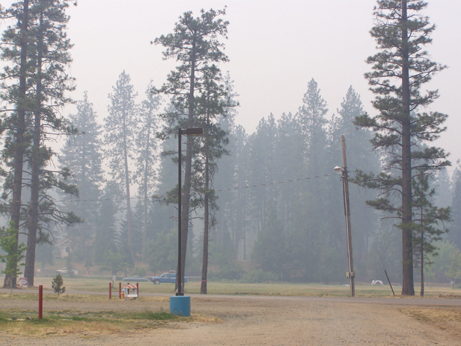 The local paper advises that outdoor activity should be avoided today because of heavy smoke from fires surrounding Nevada County. The news article went on to say that if you can see and smell smoke, you are most likely breathing unhealthy levels of particulate. It’s the worst particulate levels since the district started measuring air quality 15 years ago; almost 400 micrograms per cubic meter, and the hazardous level is 260. Our little town is at the top of the priority list because “that’s where we have the most residences in proximity to the fires”, according to Greg Cleveland of the U.S. Forest Service this morning. No evacuations have been ordered but the complex grew to more than 2,000 acres overnight and inundated the Grass Valley and Nevada City area with heavy smoke. The Scotchman Fire was on the north side of the South Fork of the Yuba River Monday and stopped about one mile east of town. This is the fire closest to our house, just over a mile away. The entire Yuba River Complex is only 5 percent contained, according to authorities. With only 259 personnel on the fire, the command center is hoping to get more firefighters and equipment in coming days as other blazes die out, the Forest service authority said. He went on to say that the main area of concern is our little town. 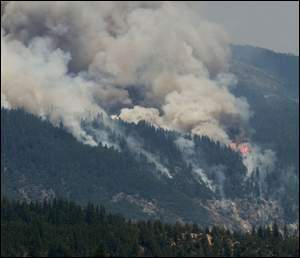 The Forest Service will hold a community meeting at 6 p.m. tonight at the local Fire District Hall for a fire update. At about 10 this morning, I took the following footage of our Airstream trailer at the Nevada County Fairgrounds. It gives you a rough idea of how smoky the air is — but you have to breathe it to really believe it! My final rehearsal for the Trio for Horn, Violin and Piano is this afternoon at the hall; then I’ll have a three-hour break before the concert. James suggested driving me to the concert hall — even though it’s only a seven-minute walk from our campsite — to minimize my exposure to the excessive smoke. I am already hacking and coughing, even inside the air-conditioned trailer. There’s a little tickle in the back of my throat which won’t go away. As for James, he is feeling ever-so-slightly better as a result of taking antibiotics. He also needs to stay indoors as much as possible. On Saturday afternoon, ominous black clouds filled the sky over the Nevada County Fairgrounds where James and I are staying in our Airstream trailer. We are currently being hosted by the Fairgrounds management; the summer music festival is going on right here. It’s a much more convenient commute than from our place in The Woods. In fact, it takes me all of seven minutes to walk from our campsite to the concert hall. Seeing the dark clouds made us hope for rain, which is so desperately needed all over California. It didn’t precipitate in our immediate area, but other areas reported some brief moisture. There was a great deal of lightning; over 3000 strikes were reported throughout Northern California which resulted in 602 wildfires. One of these fires is burning only a mile-and-a-half from our house. We had no idea about any of this until D. called on the backstage telephone yesterday as I was about to play a concert. D. agreed to drive over from Nevada City to notify James at the trailer, since our cell phone was turned off. They drove up to The Woods to scope things out. D. went up the hill a mile to our neighbors who are situated closest to the fire, while James stayed at our house and gathered together our musical instruments, important papers and computer equipment and put them in the truck. Needless to say, I was somewhat preoccupied during the concert, wondering how things were going up the hill. We finally got in touch after the concert and I had returned to the trailer and turned on the phone. James told me that the area was extremely smoky, although the fire had not crossed Scotchman’s Creek just below the neighbors’. The wind had just shifted and was coming in from the southwest, so the fire would be heading away from our neighborhood. Several hours later, I met James and D. at D&L’s house in Nevada City to help unload the harps and trunks. We were grateful that they were willing to take care of our instruments. We transferred the trunks into the Scion where they will remain until the fire danger has passed. Today we’ve been in touch with the neighbor as well as L., who told us that the fire is not spreading further, but is smouldering out. Hooray! The winds are light and are not expected to pick up much, so the fire should stay confined to the ground — rather than igniting the tops of the trees, which would be very bad. Our neighbor will let us know immediately if there is a change for the worse. On another note: the music festival is going well, although the pace of rehearsals and concerts is very hectic. I can’t believe how much playing I’m doing! And this is immediately after performing sixteen shows in a row of Phantom. It feels very good to play and it is wonderful to see my old musical colleagues again, but I wish I had more time off to rest. Today is the first free day I’ve had since June 2nd. Today won’t really be free, however, because I need to practice a brand-new piece of music which we are performing tomorrow night. It’s a trio for violin, horn and piano, and is extremely difficult. Virtuosic parts for all, in fact. The composer worked with us the other day and will do so again for our final rehearsal tomorrow afternoon; then we perform the concert a few hours later. Between practice-sessions, I am listening to a MIDI file of the piece while following the score, and am writing down cues in my horn part so hopefully I won’t get lost! We are staying inside the trailer today because the air is very smoky, even thirty miles away from the scene of the mountain fires. For the past ten days, James has been suffering acutely from a sinus infection, brought on by allergies to cottonwood and other things blooming around here. He’s been so ill that he spends most of the time lying down. He was starting to feel better yesterday but then the smoke aggravated his sinus condition. He finally went to the clinic today and has begun taking antibiotics. It always distresses me when James is sick — it doesn’t happen very often but really zaps him when it does. Last year at this time, I was the one who was sick (with bronchitis) which lasted for over two months. Our global environment seems less and less hospitable than it used to be. 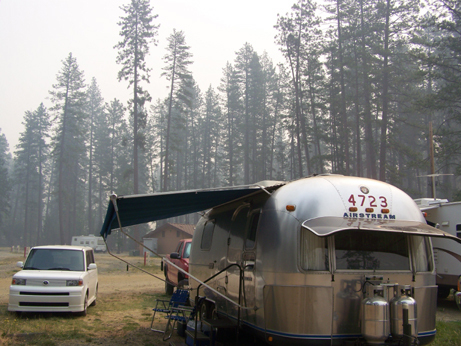 Here is a video of bringing the Airstream down from The Woods to the Nevada County Fairgrounds last Wednesday. In all the excitement, I forgot to take footage of our actual arrival at the campground, so I’ll take pictures of our current location next time. Rupert rode with me in the Scion and was pretty good, although he vocalized his usual displeasure of traveling in the car. Since June 3rd, I have been immersed in the eight-shows-a-week routine with my former employer, the national touring company of “The Phantom of the Opera”, currently playing in Sacramento. I am playing as a horn sub to fill in for the final half of the run, sixteen shows in a row without a day off. The last time I played the show was sixteen months ago, in February 2007 — in Des Moines, Iowa. I was assured by my pit orchestra colleagues that it was like riding a bicycle. I joked that I hoped I didn’t fall off. Well, they turned out to be right; after ten shows here I feel like I’ve never left! It took four performances to feel completely at ease, but now the show is wearing like a comfortable old shoe. It is interesting on a number of levels to be back with the company, even if briefly. Although the road life is hard and the show schedule is demanding, there are lots of worse music gigs. It is nice to have a regular routine with very few unexpected musical curve-balls. It is reassuring in its predictability — now that I’m not burned out. The gig pays well and people LOVE the show. It is nice to be able to wear “pit black” clothes — cotton pants and polo shirt — rather than donning a confining tuxedo or white tie and tails while being exposed under the hot, bright lights onstage as I am for symphonic concerts. In the pit, unseen by the audience, it’s great to be able to read a book between passages; the horns do have minutes at a time during the show when we’re not playing. I got a LOT of reading done over those ten years! Most people in the company — musicians, actors and stage technicians — are very happy to see me, and vice-versa. My presence was appreciated while I was on tour, but I had forgotten just how welcoming these people are. It is indeed a family. I am glad to see that everybody is doing well. I admire them for sticking with the road routine, which is a very challenging life. But for me after ten years on tour, I decided to give notice because I was getting a bit frayed around the edges from the relentless schedule. I wouldn’t want to gallivant all over the country and be away from home for months at a stretch, but I am interested in being an occasional sub, playing a few weeks a year. The two horn players on staff would be able to take more vacations if they can depend upon me as the first-call sub. So it’s a win-win for everybody. I am already slated to play the three-week run in Spokane during the month of October. James and I will drive our little Scion up there, and will stay in a corporate apartment or at a B&B. At this point, we probably won’t take the trailer. Gas has gotten so expensive that it’s no longer cost-effective to use the big truck on long trips. I had a brief window of free time late Sunday and the early part of Monday, so James picked me up from the theatre after the matinee and we drove back up to The Woods, which is an hour and forty-minute trip. It was wonderful to be home again and stay overnight, even though it was for less than twenty-four hours. I had to be back in Sacramento to play the show on Monday night. The aspect of being in The Woods which never fails to surprise me is how QUIET it is up there. 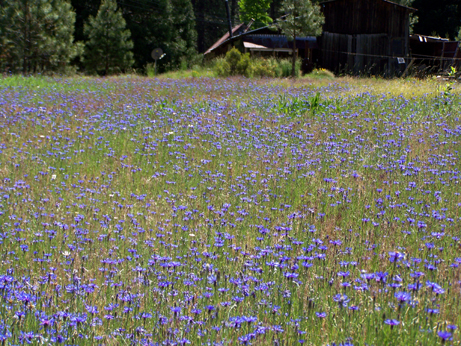 In the gathering dusk of Sunday evening, James and I sipped cocktails and sat on the back patio gazing out at the meadow, full of brilliant bluish-purple bachelor buttons. We breathed in the peace and quiet and thanked our lucky stars that we have the wonderful opportunity to tend this land. 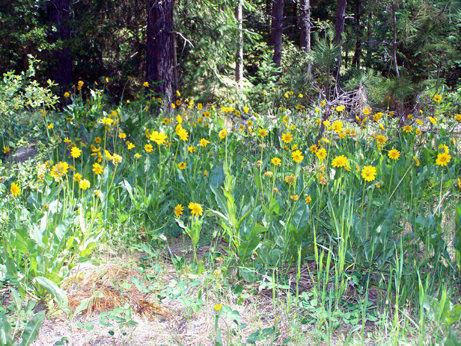 The next morning, we walked along our paths in The Woods and I took some pictures of the new flowers which have popped up. There are clumps of safflowers growing everywhere. 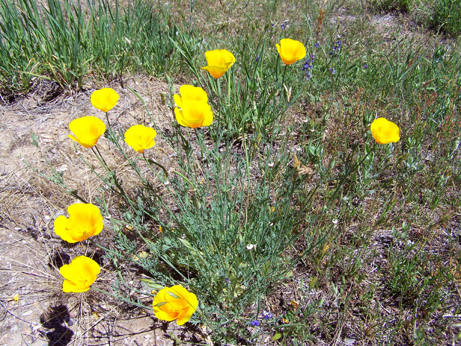 They are not native to the region, but originated from bird-seed. Our nearest neighbors apparently fed a lot of birds in the past. I wouldn’t have known that if our dear friend L. hadn’t told us on her recent visit. 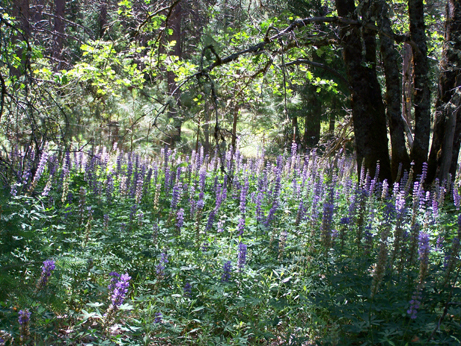 She and long-time partner D. came up from Nevada City to see the new crop of wildflowers a few weeks ago. We wended our way down the “scenic route” path to the river (documented in a previous video). I may take another video because the path looks completely different this month, with much more leafy undergrowth. 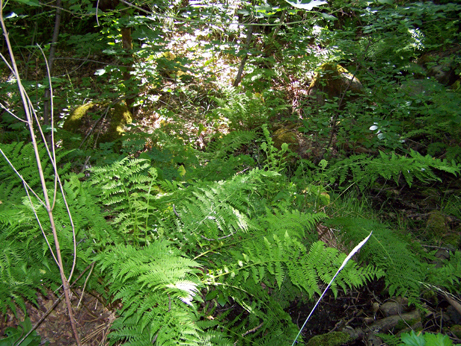 For now, however, let us be content with a shot of a stand of ferns, where the largest bed of trilliums used to be. Here’s a shot which includes the barn in the background. It is slightly to the right of the previous picture (to the south). 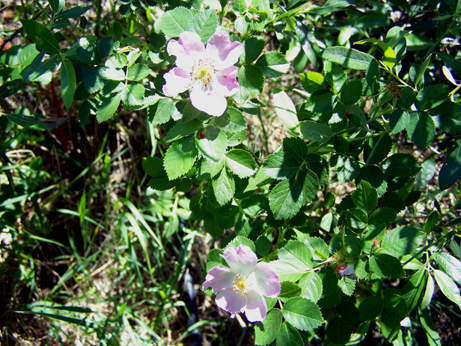 On our way back towards the barn, we stopped to take a picture of an ancient rose-bush which may have been placed there by the owners, long ago. The term “tea rose” comes to my mind but this may be incorrect. If anyone can enlighten me further, I welcome the feedback. Lastly, here’s a video of several things: the Yuba River at the height of its flow on May 31st, contrasting with more recent footage taken last Monday in approximately the same spot. 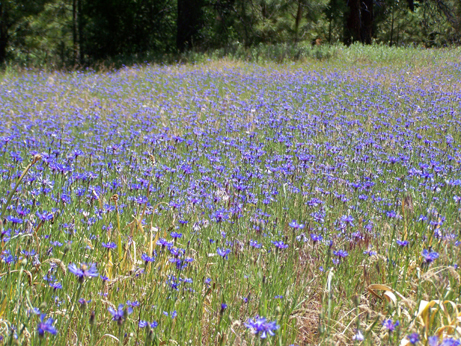 Then, you will see how extensive the field of bachelor buttons is in the meadow (please forgive the somewhat jerky panning; I was being attacked by a mosquito!) The final segment is of an industrious bumblebee visiting the tea roses. I have six more performances of Phantom through Saturday. Immediately following the last show, James will pick me up from the theatre, kitty Rupert and our possessions in tow, and we’ll head on back up to The Woods late Saturday night. 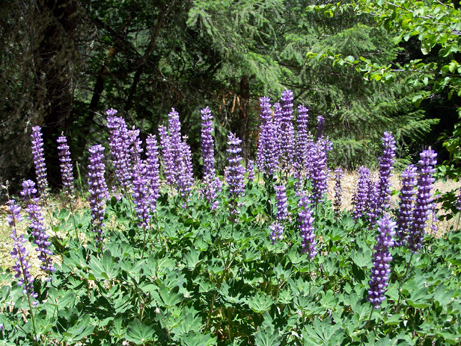 The next evening, Sunday, I immediately jump into playing the local summer orchestra festival “Music in the Mountains” in nearby Grass Valley (which I participated in each June from 1985-2001) and will be busy with that through July 3rd. The horn will have been on my face constantly for about six weeks, so I’m looking forward to a break later this summer!